In this episode, Jay is joined by author Jessica Vaughn to address the question: What are signs that your relationship with God is being hindered? 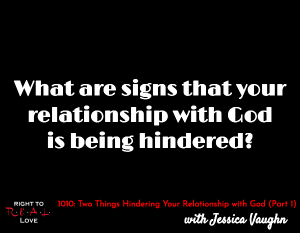 What are signs that your relationship with God is being hindered? The importance of God being the top priority in our lives. Why the Word of God must come before the world. Signs that your relationship with God is being hindered. How idols can hinder your relationship with Jesus Christ. How good things in your life can become idols. Why God desires to be the top priority in our lives. Jessica opens up about what happens in her life when she puts other things before God. Acknowledge that there may be idols in your life that you need to address. Genuinely repent to God for the idols in your life.